3-Sheet (41 x 81 inch) Movie Poster from the 1970 rock and roll documentary Let It Be starring the Beatles: John Lennon, Paul McCartney, George Harrison and Ringo Starr. This poster is folded as issued and printed in two overlapping panels The poster is unused, with no pinholes, tape or tears. As collectors ourselves, we pack every item to arrive undamaged. My web site is one of the oldest and most trusted sources of vintage movie poster and lobby cards on the internet. For more details please see my ME page. 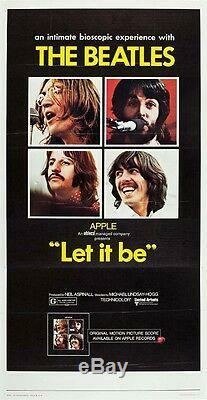 The item "LET IT BE THE BEATLES JOHN LENNON PAUL McCARTNEY 1970 3-SHEET NM" is in sale since Tuesday, February 26, 2013. This item is in the category "Entertainment Memorabilia\Movie Memorabilia\Posters\Originals-United States\1970-79".com" and is located in Huntington, New York.